Like many of UCLA’s students, Sahil hails from northern California growing up in the quaint suburbs of the Bay Area. Growing up in high school, he was actively involved with his marching band, playing the alto saxophone and piano. Interestingly enough, Sahil’s affinity for jazz music and the opportunity to play for the marching band was a pivotal reason he attended UCLA, a testament for his passion for music and the creative arts. Despite being initially rejected by UCLA, Sahil was offered a spot on the UCLA marching band after he created a last-minute audition tape that attracted the attention of UCLA’s band director. 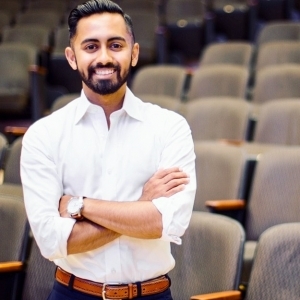 Having graduated UCLA in 2013 with a Bachelor’s degree in Economics and a minor in Film Television & Digital Media Studies, Sahil’s decision to major in Economics was primarily motivated by his desire to learn about various aspects of business and finance. Moreover, he was impressed by the range of electives and lab courses offered by the Economics Department. He recognizes that drawing students to the major means balancing a fine line between theoretical coursework and courses that are more practical and professionally geared in nature. He believes UCLA recognizes this and that the narrative is slowly starting to change as fields like financial engineering and behavioral economics emerge. Despite his rocky path getting into UCLA, Sahil has directly contributed to some of the university’s greatest facets. In his time here, he served as the President of Bruin Consulting and was one of the nine founding fathers of Sigma Eta Pi (SEP). With his friends, he realized the lack of entrepreneurship fraternities on the entirety of the west coast while fields like medicine, business, and law had full-fledged professional fraternities. By adopting a collaborative mindset, they were able to establish the first entrepreneurship fraternity on the west coast. The time he spent working with these organizations at UCLA taught him how to cultivate trust, work with a breadth of personalities and become a galvanizing leader without overstepping any boundaries. All the time spent gearing towards professional development helped prepare Sahil for his role as an L.E.K consultant upon graduating. During his time at L.E.K, he forecasted industry trends, developed OTT media strategies and worked on over 35 different engagements spanning 3 years. Despite the tremendous learning curve, Sahil remarks that it was an invaluable experience. That said, as time went on, he wanted to transition out of consulting. Eventually, he turned to the media company Discovery Communications, whose programs he had watched since his youth. This gave him the chance to work on content strategy, marketing, and distribution across various Discovery Communication platforms. Now Sahil serves on the Marketing Planning & Analysis team at Netflix. He describes his role as that of an internal consultant, leveraging data-driven insights and conducting market research to better support Netflix’s creative marketing & PR teams. He contends that success in the media industry and any industry, for that matter, requires being able to lead and understand what motivates the people around you. Figuring out how to best align the objectives of various stakeholders is a skill that will go a long way. Moreover, Sahil firmly believes that success in his field implies constant learning and that anyone seriously interested in pursuing a career in the media industry needs to be prepared to learn every day about the changes taking place, shifts in consumer behavior, new mediums of distribution, content providers etc. Aside from growing his own professional career, Sahil seeks to make a tangible impact on the careers of our Bruins. His started his company The Aspiring Professional to coach students one on one and provide career guidance at a personal level. Moreover, he serves on the board of the UCLA Alumni Association and has conducted numerous career-focused seminars for UCLA students at the career center. Having gone through the arduous recruitment process, he knows the challenges students face when it comes to securing a job. His seminars have no doubt shaped the careers of countless students, who enjoy his practical and actionable approach to navigating the recruitment process. To him, the satisfaction gleaned from making a tangible difference in their lives is an unmatched feeling. In his quest to strike a good work-life balance, Sahil takes the time to go for long drives and regularly attends improv comedy shows. Moving forward, he hopes to continue growing his speaking and coaching practices whilst fostering more meaningful relationships with UCLA and other universities. Ultimately, that is the legacy he would like to leave behind. Rethinking Randomized Controlled Trials Are banks now safer?